The only book readily available from Peter Dombrovskis is ‘Simply’ which although reaching the end of it’s print run, can still be bought from a couple of places in Tasmania (see Peter’s website for details) - I bought mine from Book City in Australia. The book is a gem and many of the pictures look like they could have been taken yesterday. A few pictures in the book stand out for me though, in particular the Myrtle Tree and the long shot of Bathurst Harbour, both seen below. The short entries by various botanists (at least I presume they are botanists - there are no descriptions of who these people are) seem shoehorned into the book in order to demonstrate Peter’s environmental credentials. Not that they aren’t interesting but seem decoupled from the book as if an afterthought. The preface and essays (by Patricia Sabine, director the Wilderness Gallery, Tasmania and Gael Newton senior curator of photography at the National Gallery of Australia) provide a quick background on Australian photography of the era and of Peter’s work in particular. 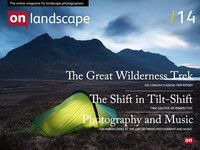 The Quiet Land is Peter’s first publication and this shows in some of the photographs, however many of the pictures demonstrate the unique view that he was developing, particular personal favourites are Four Peaks from Thwaites Plateua, Forest Floor and Weindorfer’s Bath Hut (shown below). The book combines poetry with the images, a very 70’s / 80’s thing to do and something I can’t really assess as I’m not really the poetry sort. I do like a particular quote from Peter’s introductory text ..
"The Quiet Land" can be bought through second hand book brokers, Abebooks or Alibris for about £50 for a fairly good copy (although you will probably have to buy internationally - postage is cheap though). I shall hopefully be getting hold of a couple more of Peter’s books at some point in the future and will add reviews of them as and when..
Also you can view the video below which features Joe talking about Peter's work and some of his books..
Joe Cornish talks about Peter Dombrovskis from Tim Parkin on Vimeo.